Storage Condition: Keep away from direct sunlight and store in a cool dry place. Ingredients: Broad Bean (75.98%), Starch (Corn Starch), Wheat Flour (10%), Sugar, Vegetable Oil (Palm Oil), Maltodextrin, Salt, Colours (E102, E133), Flavour Enhancer (E621), Anti-oxidant (E319), Flavouring. 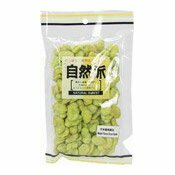 Simply enter your details below and we will send you an e-mail when “Wasabi Flavoured Broad Beans (Peas) (自然派芥辣蠶豆酥)” is back in stock!